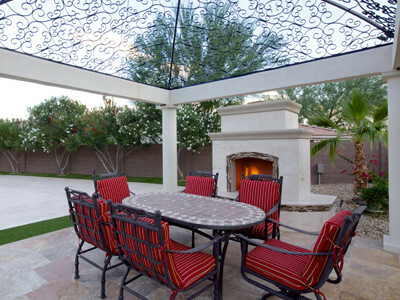 Want a great way to enhance the beauty of your Arizona property? Then have fireplaces or fire pits installed. Customized or pre-built, these fire features can definitely transform any landscape from beautiful to magical, especially during the cold winter nights. Warmth and comfort. What can be more comfortable than the warmth of a lighted fireplace in a cold winter night? Snuggle up with your family and friends and let the warmth seep in, as you share the stories of the day. Beauty. These fire features look good any which way you look at them. Light them up and you’ll fall in love with the magical effect they have for the area. Increase the value of your home. Homes with fireplaces fetch a higher price than those without. The intent is to create a warm and inviting outdoor space for entertaining and casual conversation. The fireplace might be the main focal point or be part of a more expansive outdoor area that includes a kitchen and hot tub. With a fireplace or fire pit installed in your landscape, you’ll never have to spend another cold, winter night indoors again. The heat from these fire features can give you a warm, comfy feeling come winter time.